In Westbury at Andy’s bakery and gelato shop, I meet Ann a home spinner who has a stall at the 3 day Australian Art and Craft Fair being held in Deloraine. “Good luck with that” I said as I rode off. But who knows? Like knitting, crochet and felting, perhaps spinning your own yarn direct from the animal will become the next hipster pastime. Maybe they could spin their own beards! 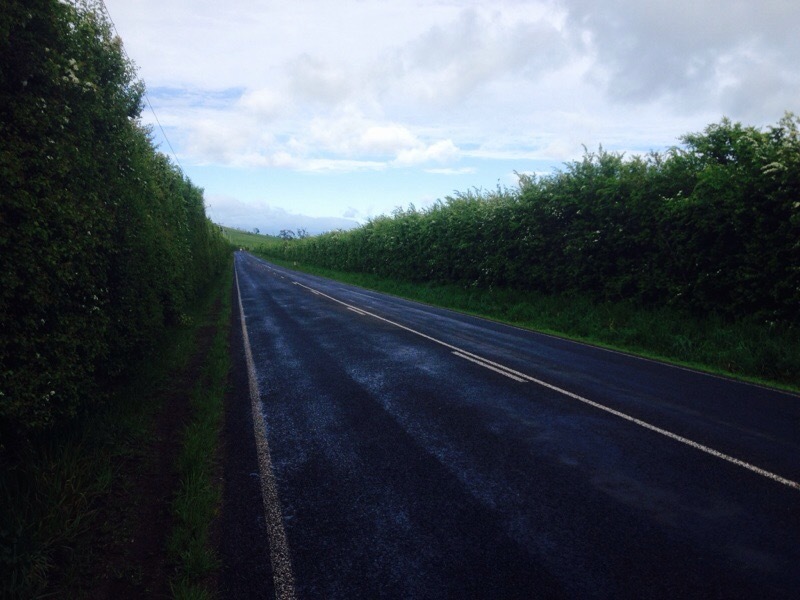 A gentle rolling 20 kilometres from Westbury to Deloraine through the hedge rows. Light showers, wind. then bright sunshine. 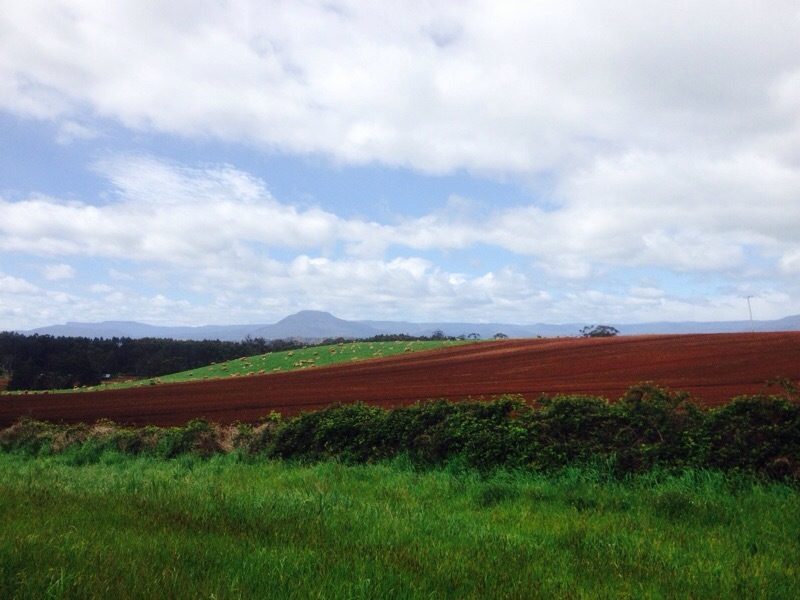 The many moods of Tasmania. 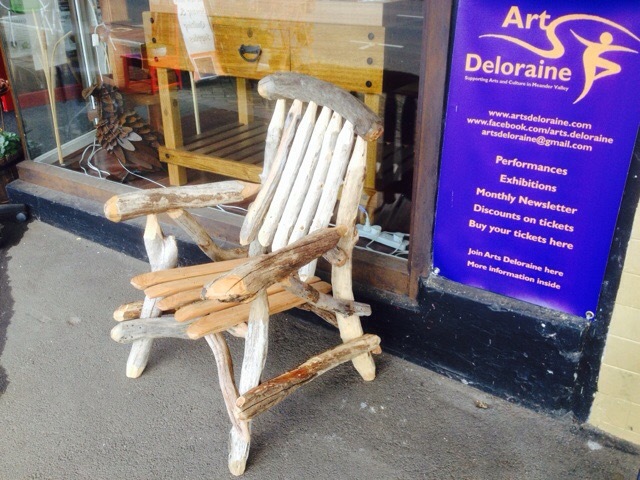 I stopped at Deloraine and I was impressed by the quality of art and craft on display at the Deloraine Artists Collective. I liked the collective because all their work is bespoke unique and a little quirky. Not unlike the good artists themselves. I strolled around the streets with hundreds of others. Couples, mostly women, looking in the shop windows, talking in small groups, many in ponchos, flowing skirts and scarves. A crafty looking crowd if ever there was. As I cycled out of town blustery showers gave me a good drenching. 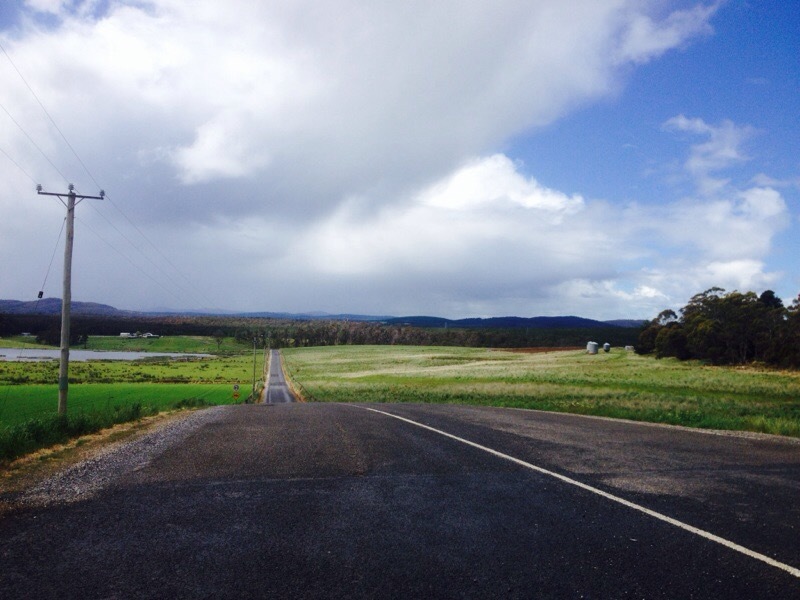 Snow predicted down to 400 metres in Tassie today. 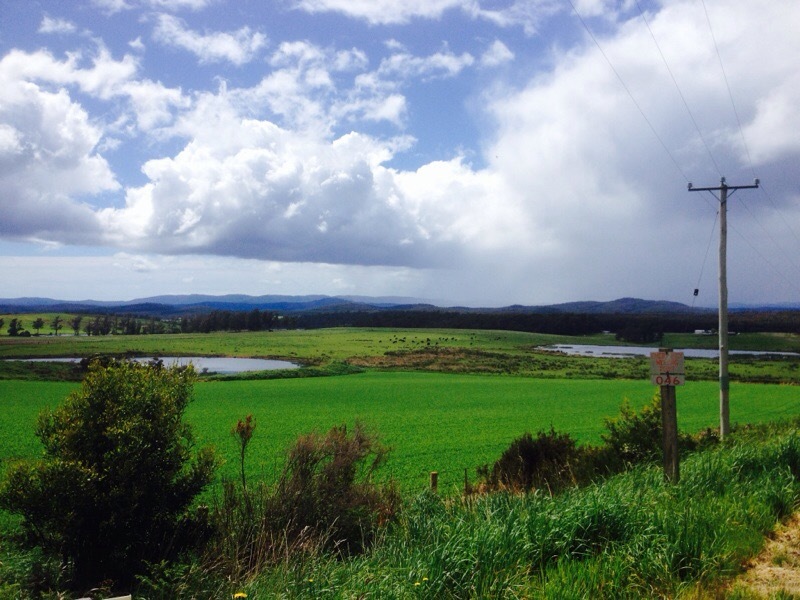 The snow held off while I dawdled the last 50kms to Devonport. Drinking in the last drops of beauty this island state has to offer. 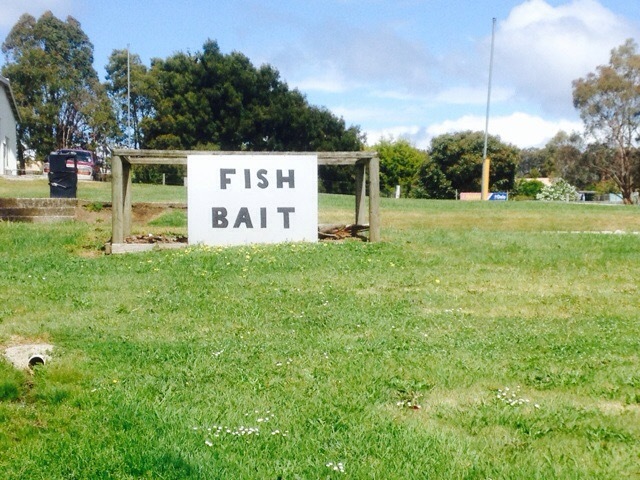 Tasmania really is a gourmet’s paradise. While it’s difficult to load up on goodies when touring, I did sample cheese, chocolate and cherries today. 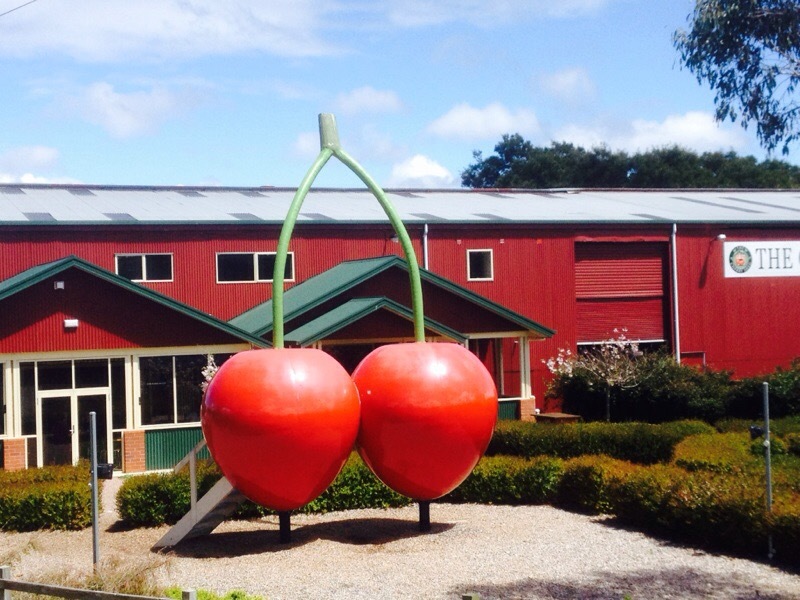 The Cherry Shed provided me with another entry into my Big List of Australian Big Things! Cycling into a subdued Devonport on a wet Saturday afternoon. I rode around the city which is dominated by massive cement and grain silos. Monoliths that sit Easter Island like alongside the Mersey River. I found a bookshop I pick up a copy of ” The Narrow Road to the Deep North by Tasmania’s favourite son and winner of this year’s Man Booker Prize, Richard Flanagan. Cycling adventures only end so others can begin. 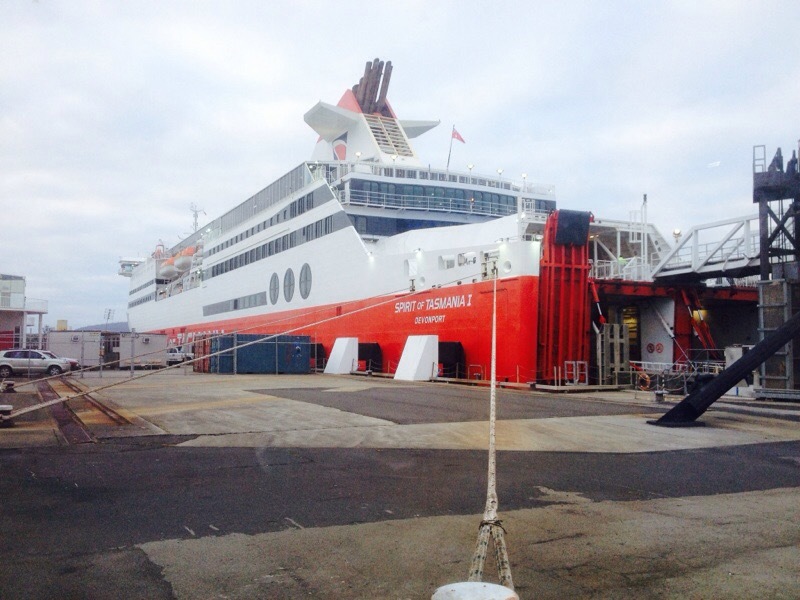 Tonight I take Spirit of Tasmania Ferry across Bass Straight to Melbourne and home. I was walking around Deloraine Art and Craft Fair yesterday also. I did see someone on a push bike with panniers, ride into town about 9am. Nearly yelled out ‘is that you Nick’. But didn’t. Now wish I had!!! Good luck settling into work, and I look forward to your next trip! Thanks for the commentary.